there are few things i love more than puttering around the kitchen in the late afternoon, roasting vegetables and sautéing onion & garlic for a homemade soup. this meal came out of an almost empty fridge and a loss of what to cook for dinner, but a burning desire to break our becoming-too-constant take-out habit. 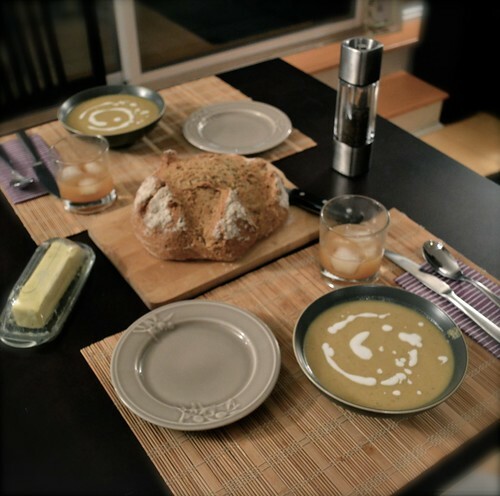 so i grabbed the cute little parsnips that i had bought at the farmer's market last week (from the man who had pulled them out of his garden the night before) and looked up the delicious parsnip soup recipe i knew i had made last year around this time. 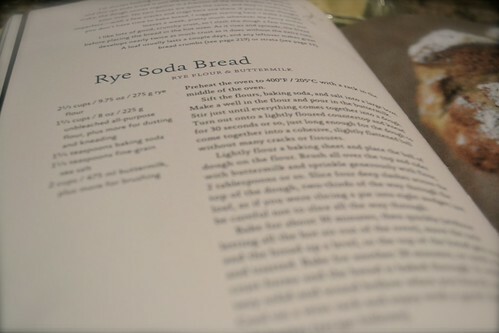 as i prepared the soup, i realized that nothing would compliment it better than a thick, crusty loaf of bread, so i pulled out my lovely new cookbook and flipped to the rye soda bread recipe that i'd been waiting to have the opportunity to try. that is how most of my meals come about... i have an urge for something, or i notice something in my fridge that doesn't quite fit in with our normal routine, and i build a meal around it. i love cooking this way, and it lends itself quite well to my farmer's market shopping habits - if there's a new vegetable or squash at the market one morning, i'll pick it up with the faith that i'll be able to find or make up a recipe to go along with it sometime that week. 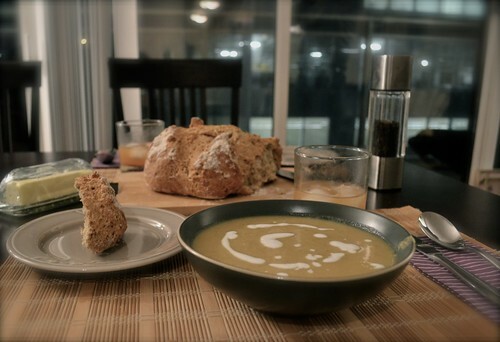 this soup is perfect for a cold fall day. the flavours of parsnip and apple work delightfully well together (and as neither one of us can say we are a big fan of parsnips, this is a big plus since i usually find them so cute i buy them anyway) and they fold in perfectly with the curry and coconut notes of the soup. this bread is one i'll definitely be making over and over. 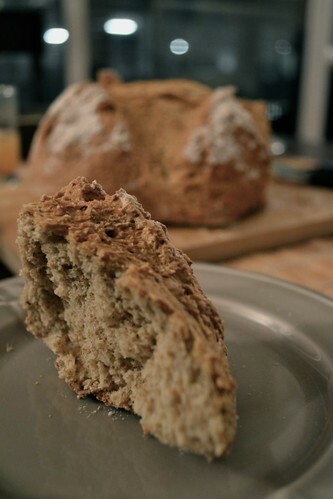 it's a soda bread, so the flavour is different than a yeast bread, but there is virtually no kneading or waiting time involved. you mix the five ingredients together, fold the sticky dough in on itself a few times to smooth it out, throw it on a pan, and let it magically become a rustic loaf of bread in your oven. i can confidently say that those days of sadly discovering that the bread cupboard is empty are over. preheat oven to 450F. toss parsnips in olive oil, place in single layer on baking tray, and roast in the oven 15-20 minutes (stirring every 5-7 minutes) until brown but not cooked through. while the parsnips are roasting, melt butter in a big pot over medium heat. add the chopped shallots and ginger, and sauté for 4-5 minutes, stirring constantly to prevent burning. add 1/2 cup of the vegetable stock, the curry powder, cumin, parsnips, and apple, and simmer for a few minutes to combine the flavours. add the rest of the vegetable stock, then cover and simmer on medium-low for 15 minutes. puree the soup (use an immersion blender if you have one, or transfer in batches to a blender to puree) and add the coconut milk. taste, and add more coconut milk, salt, and/or spices to taste. if you like the soup thinner, add a little water. if you like it thicker, let it simmer on medium-low, uncovered, until some of the water boils off. 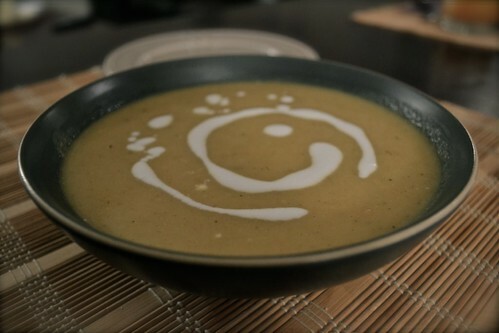 serve hot in bowls, and swirl a little coconut milk over the top of each bowl of soup. serve with torn up chunks of a crusty bread and lots of butter. 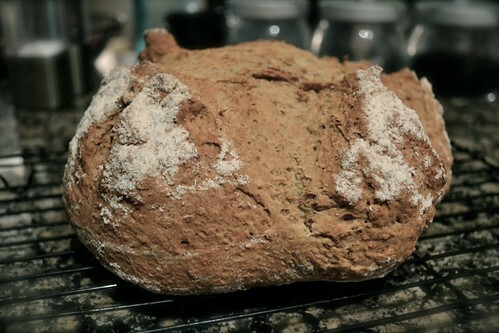 heidi's recipe is for rye soda bread, and she uses both rye and all purpose flours. i only had whole wheat flour, so i used 100% whole wheat flour. it turned out very well, with a nice hearty texture and taste, but i am definitely picking up some rye flour this weekend to give out her original recipe a try. preheat oven to 400F, with the rack in the middle of the oven. sift the flour, baking soda, and salt together in a big bowl. make a well in the dry ingredients and pour in the buttermilk. stir just until everything comes together into a dough, then turn out onto a lightly floured board or countertop. knead for 30 seconds or so, just long enough for the dough to come together into a cohesive, slightly flattened ball without many cracks or fissures. lightly flour a baking sheet and place the ball of dough on the flour. brush all over the top and sides with buttermilk and sprinkle with flour, about 1 tbsp or so. slice the dough with four deep slashes, cutting at least halfway through (as though you are slicing a pie) - you may find this is easier to do if you wet the knife blade first. bake for 30 minutes, then quickly move the rack and the bread up a level to give the top of the bread a nice crust. bake for another 15-20 minutes, or until a hard crust forms and the bread is baked through. it will feel very solid and sound hollow when you knock on its base. cool on a wire rack, then pull off chunks while still warm and slather with butter. dip in soup. 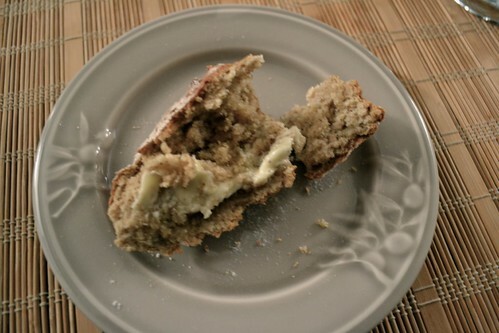 i made irish soad bread on st. patricks day. it was so good!